My favourite line this Shabbos: "Glenhazel is overrated". That was overheard at Havdalah time after guests from various communities around town had joined us for a truly spectacular Shabbos. Kudos to Dani Zekry, Hazel Lerman, Candice Kessler and Shaun Levitan for producing a Shabbos for the history books. Friday evening kicked off with hundreds of women and girls commandeering the Shul for a mega candle-lighting. Yael Benjamin enthralled the crowd with stirring Shabbos melodies and Rebbetzin Ruthie Abrahamson shared Shabbos insights. Meanwhile, the men followed the ancient Kabbalistic tradition of going outdoors to welcome Shabbos. They davened Mincha outside and then sang Shabbos songs in the rock garden, before hearing an insight from Rabbi Gavriel Abrahamson. Shabbos got off to a scintillating start. Kabbolas Shabbos saw a larger-than-Yom-Kippur crowd, with over 100 guests joining us for the Dove Barmitzvah. At 41 hotel rooms, Chabad Strathavon surely holds the record for the most booked for the Shabbos Project. Nami Falkson led the davening and Lecha Dodi erupted into song and dance around the Shul. After the service, everyone joined to sing Shalom Aleichem and Eishes Chayil and to enjoy a light kiddush under the stars. Our shul was abuzz on Shabbos morning, with scores of children enjoying the various children's service offerings (thanks Gary Weinstein!) and play stations. Shul was absolutely packed and, yet, the decorum was excellent. Yoav Dogan led the first part of Shacharis and Jonathan Ruch, the second. A highlight of the day was Barmitzvah boy, Josh Dove leading Hallel. Rabbi Hilton Herring davened the special Rosh Chodesh Musaf. After a massive kiddush and special mazal tov to Josh, the barmi boy, the crowd headed down to our Shabbos in the Park. Unbelievably, the park had been transformed into a chilled family space. Bean bags, picnic blankets, cafe tables and picnic tables dotted the area and people quickly relaxed into them. Food was abundant and delicious and the weather perfected the day. The kids enjoyed special activities and everyone simply took it easy. 250 people joined us in the park and nobody seemed to want to leave. What better way to spend a special Shabbos than with your family and community? This year's Yom Tov season was honestly one of the best we've ever had. And, the momentum continues! Of course, the Shabbos Project is definitely pumping up the action at Strathavon this week. Add to that the Dove barmitzvah and we're in for a really special, mega-Shabbos. Our Shabbos Project team has done an outstanding job putting together a spectacular programme. 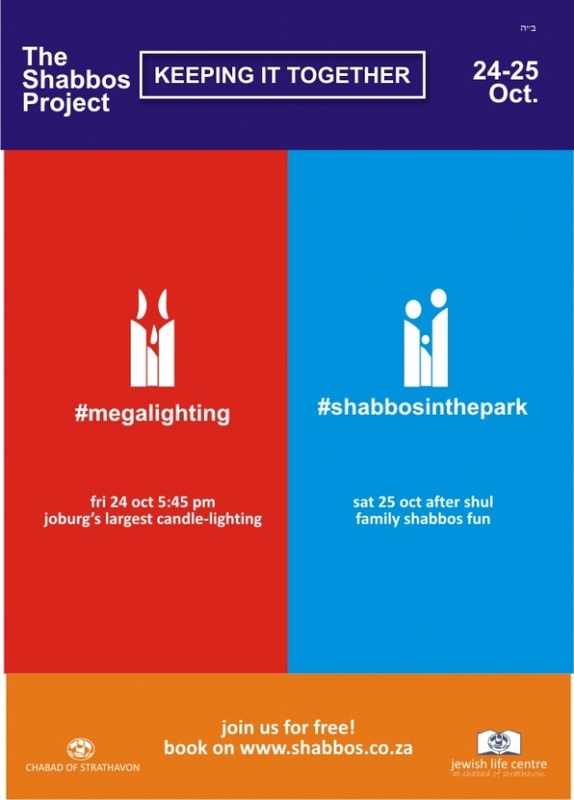 Shabbos will begin with a special candle-lighting programme for women. The programme includes spiritual insights into candle-lighting by our Rebbetzin and Rebbetzin Ruthie Abrahamson, special prayers and song with Yael Benjamin. The men will daven an outdoor Mincha and relive the ancient Kabbalistic tradition of going outdoors to welcome Shabbos. Rabbi Gavriel Abrahamson will share some insights before davening and Nami Falkson will lead us in singing to welcome Shabbos. After Shul, we will have a kiddush under the stars. We have great children's entertainment on Shabbos as well, so your kids will have a wonderful Shabbos experience. We'll have a special davening, seeing as it is Rosh Chodesh. Josh, our barmitzvah boy, will lead the Hallel. After the Barmitzvah kiddush, we're heading down to the park for an overbooked Shabbos in the Park. The programme there includes family learning, kids' activities and traditional Shabbos songs. Don't worry, we have all sorts of creative seating plans for the park- blankets, benches & picnic tables, cafe tables & chairs and bean bags available. Thank G-d, we have had a very good response to the Shabbos in the Park and are full. We have excellent security in place over Shabbos, both at Shul and at the park. If you would like to park your car at Shul over Shabbos, please note that we will lock the gate at 5:45 p.m. The Chief Rabbi has also organised free Uber for first time users to get to Shul before Shabbos (to the value of R200). Go to www.uber.com to download the app and use the code keepingittogether. Thank you Dani Zekry, Hazel Lerman, Candice Kessler, Shaun Levitan, Gary Weinstein, Charlie Meyerowitz, Robin Bayhack and Steven Chalom for putting together a truly spectacular Shabbos. Special thank you to our sponsors, who helped make this Shabbos amazing: Liberty, Neil & Lauren Dove, Ronen & Dani Zekry, Marc & Hayley Wachsberger, Mark & Shirley Collie, Shaun & Hayley Levitan and Shaun & Dina Hurwitz. The Shabbos Project is right after Yom Tov, and our team has spectacular plans to make it something special. Highlights are: Mega candle-lighting, Kiddush under the stars, Shabbos in the Park and Havdalah ceremony. 3) Consider hosting someone for that Shabbos. 4) Bring a siddur or two from home (with your name in), so that we have enough for everyone on what is going to PG be a busy Shabbos. Thanks to the generosity of Michael Mendelowitz and family, as well as the input of a few of our Shul's members, the much-anticipated installation of ceilings on the two wings of the Shul is now in progress. This exciting development will, please G-d, be completed in time for the Shabbos of the Shabbos Project. We were BH bursting at the seams over Yom Kippur! Besides the extra seats we put out following Rosh Hashanah, we had to put out extra, extra seats at Kol Nidrei. Yoav Dogan, Rabbi Groner and Rabbi Shishler conducted a powerful davening, punctuated with page-guidance, practical instructions and insights shared by Tzur Gerber and members of the community. Once again, our security team ran a slick operation, which allowed us all to daven with peace of mind. At Yizkor, the rabbi spoke about ensuring that our children receive excellent Jewish educations, paying tribute to Rabbi Nachman Bernhard, who was a pioneer of Torah education in South Africa. As the rabbi said, "You ask your rabbi for advice on medical and business matters, you should consult him (and the rebbetzin) on his real area of expertise: Jewish education. Before Neilah, the rabbi shared stories of how the Rebbe predicted in the 60's that Communism would fall, but it took time. He likewise predicted that we'd see Moshiach in our times, so we shouldn't lose hope if it seems to have taken long. As every year, the service ended with the spine-tingling chants of Shema Yisroel and Hashem Hu HoElokim, followed by the uplifting victory tune, known as Napoleon's March. Breaking of the fast was sponsored by Ziona Lipchick. 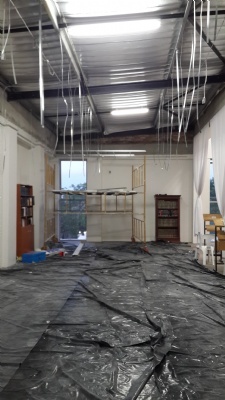 The good news of Yom Kippur was the announcement that a principal donor and a number of secondary donors had stepped up to complete the installation of the long-awaited ceilings on the wings of the Shul. Next project: Ceilings for the kitchens and bathrooms and the the remaining light-fittings. Welcome to the Chabad of Strathavon Community blog. We'll post updates and news about the SHUL on this blog (the blog about the Jewish Life Centre can be accessed here). Got a guest blog post to add? Please send it through to us and, if it's good enough, we'll publish it.